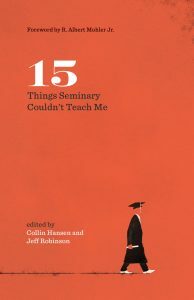 This steady barrage of content emphasizing the couldn’t of seminaries may have prompted a few to ask: “Why is TGC slamming seminaries all of a sudden?” It’s an especially perplexing question because several of the contributors (including the editors) teach at or are presidents of seminaries, and most acknowledge the value of seminary in their videos. As someone with a foot in both worlds (Reformed Theological Seminary and a local Presbyterian church), I was particularly intrigued. No seminary professors I know would ever pretend that seminary education alone “makes” a pastor, or that it equips would-be ministers, missionaries, evangelists, and teachers with everything they need (nor would, say, a medical school). All major seminaries feature ministry apprenticeships and ordination preparation as prominent pieces of the full educational package. However, the couldn’t of the videos and book may have potential negative side effects. They might fuel what has become a growing trend—particularly among non-denominational movements that don’t generally require ministry degrees—of rejecting the role and value of seminary education altogether. This perception ebbs and flows, but as most admissions departments will admit, it’s fairly strong at present. Many people believe that seminaries are all about head knowledge, and that the only preparation you need for ministry is on-the-job, whether shadowing a pastor or learning the ropes as a pastor. Knowing that TGC’s series wasn’t intentionally perpetuating this misconception, I wrote a response that attempted to complement and balance the discussion. TGC, in turn, kindly asked me to abridge it here. If we all agree on the value of on-the-job ministry training, what is the contribution of seminaries? What value do they add that a church apprenticeship under an (overworked) pastor can’t replicate? In other words, why pursue formal theological training at all? Here are 15 benefits seminary offers you that your busy pastor(ate) can’t. Any church where you train will, almost by necessity, tend to think within a given tradition about theological matters. Yet there is something immensely valuable in studying deeply the theological views of other parts of Christendom. To converse with students and faculty who hold, with strong biblical conviction, a different position than your own. To study opposing arguments firsthand, rather than filtered secondhand through someone from your neck of the woods. To sharpen your own thinking but also develop theological charity. There are simply few opportunities to do this in such a rigorous way when you’re grappling with day-to-day ministry and learning from a mentor with whom you are incentivized to agree. This dynamic also extends beyond denominational lines. Seminary is an amazing opportunity for male and female students—regardless of one’s views on ordination questions—to interact with one another in a serious, robust way over theology, ethics, and practice. Working in the trenches of a local church can engender a kind of myopia in terms of how to “do” church. We can tend to think our current church—or a prior church experience—is the gold standard for all things. However, seminary—particularly one that isn’t wed to a single denomination—provides an almost unparalleled opportunity to learn how other sincere, thoughtful, historically informed Christians do practical things in ministry: liturgy, preaching, music, men’s ministry, women’s ministry, evangelism, social media, and so on. You don’t have to agree with them, but learning from them is essential to being well-rounded. We live in an era of personality-driven churches. Particularly in big churches, there’s a tendency to idolize how your ministry team or senior pastor does things and to seek to be fashioned after them. Due to the presence of numerous seasoned voices (faculty, guest speakers, fellow students) who aren’t nearly as impressed by your senior pastor as you are, seminary offers a rare opportunity to step back and think critically about yourself and your dominant pastoral influences’ strengths, weaknesses, and blind spots. You can learn Hebrew vocabulary or Greek paradigms online, subscribe to daily podcasts, and figure out how to click around in BibleWorks. But none of that cultivates the instincts of responsible exegesis beyond dropping “the Greek really says” in sermons. And left unchecked, the tyranny of the urgent in pastoral ministry will drown out the use of biblical languages, let alone their enjoyment. Seminary—at least those that still offer robust language training and not simply “how to use the computer”—is the primary place you can not only learn the languages, but, more importantly, see them used in a responsible way. That happens in community, in day-to-day grinding it out, showing how the stuff you’ve memorized matters. No one becomes a carpenter by watching YouTube videos. That only gives the appearance of competency. Real, lasting competency comes in grasping the tools and using them under the watchful eye of one who knows what they’re doing. A ministry week inevitably fills up with crises. The temptation is to slip into reaction mode: do whatever works to make staff happy, keep the elders on board, balance the budget, and maintain attendance. One of the underemphasized blessings of seminary education is that it forces you to pause and think rather than just respond. This is all normal. But one of the underemphasized blessings of seminary education is that it forces you (through assignments, lectures, guest speakers) to pause and think rather than just respond. To study the broad biblical, theological, and church-historical teaching on something before it becomes a fire in your own church and to cultivate disciplines that will allow you to keep doing that in the future. In church ministry you typically have at most two real sources of feedback on your sermons/lessons: (1) your pastor/mentor (if you’re fortunate) and (2) a few members of the congregation (grumpy folks, overly nice folks, your spouse) who are willing to say anything to you at all. It can become an echo chamber. Seminary is a rare opportunity to receive serious critique of your preaching/teaching from peers and professors who have no skin in the game with you, your church, or your pastor. They won’t hesitate to give you a loving, thorough evaluation of where you are and where you can improve. They don’t care that your senior pastor wants more clever anecdotes. This objectivity is immensely valuable. Nearly everyone new to pastoral ministry admits one of the hardest things is loneliness and isolation. You’re always “on.” Few are the moments when people don’t look at you as “the pastor” or “the women’s director.” Everyone in your life either is (a) your boss or (b) your flock. It becomes difficult to be vulnerable and to have friends. Seminary is one of the few times in your life when you—and, importantly, your spouse—can develop deep relationships with others who will be in a similar situation but have some distance. They “get” what you’re going through, but because they aren’t in the same church, they’re a safe outlet where you can be vulnerable about church-related and personal struggles. There is always a sermon to write or a ministry project to do. This pressure causes you to focus on activities where the “so what” is obvious, measurable, and practical. Seminary, by contrast, is a special time where you learn an incredible number of things whose measurable output may be slight in the Christian world’s eyes. You can take a course on Akkadian. You can dive deeply into ancient manuscripts, do a directed study on Second Temple Judaism, or study ancient archaeology. In most cases, such endeavors won’t have a direct effect on sermon prep. But that isn’t the only goal. The “15 things seminary couldn’t teach” motif can unfortunately reinforce the belief that the only things worth studying are those that have immediate practical impact. But this isn’t an MBA. Sometimes the impact is you. Particularly for younger folks, seminary training helps them work hard, be responsible, show up, and do their job. This basic adult formation isn’t happening with the same consistency in undergrad as it once was. Some of the best moments as a student or instructor are when class material connects with what is being covered elsewhere, so that it all starts to click in a 3D way. When the riches of 2 Corinthians 3–4 jive with the covenant theology course. When divine Christology in the Gospels brings up the same issues covered in systematics. When an analysis of the deep relationality in Paul’s letters cuts to the heart of the theology of ministry curriculum. There are few opportunities to do this during day-to-day ministry. One will read a commentary and write a sermon. One might brush up on Bavinck to do a Sunday school class on election. But the integration of the riches of the Christian tradition in a deep way, for hundreds of hours inside and outside the classroom, is unsurpassed in the seminary environment. The current cultural moment privileges 1,000-word (or 280-character) hot takes over carefully nuanced, serious reflection. The predilection for pithy emotional appeals and veneration of the person talking the loudest can permeate the church, too. Why read deeply on a subject—let alone put your thoughts down on paper—when you can retweet a blog post that supports your preconceived opinion and then move on? This is precisely why many seminary professors still assign difficult papers. Such assignments force you to grapple deeply with opposing perspectives, exhaust the biblical text at both micro and macro levels, research using materials beyond easy popular literature, produce written output in which you defend a thesis, and submit it to scrutiny by someone who can competently evaluate it. This work yields inestimable benefits to the student: to know how to argue, to know something well, and to know what you don’t know. Life in ministry is busy, and to the extent that anyone makes time to read, the gravitational pull is toward lightweight, 150-page-ish, relevant books on this topic or that. I’m not denigrating those books at all—I’m simply observing that the pastoral day-to-day doesn’t support or reward the reading of hard books. Not when there are meeting agendas or sermons or budgets clamoring for your limited attention. Apart from a sabbatical, seminary is a rare opportunity to read a handful of hard books. The tough ones like Ridderbos or Vos that aren’t easy but are worth it. Books—even paragraphs and sentences—that will change your life. Most people who enter ministry have received affirmation from others to do so. That is important. But the things that makes others notice giftings in you can also reinforce within your own heart that you’re “kind of a big deal.” That you’re the well-educated, well-spoken “big fish” of your church. This perspective, if left unchecked, gets worse over time as it metastasizes into a guru mentality. Seminary helpfully takes you out of your pond and places you in a bigger one with other fish, most of whom are also “kind of a big deal” in their home churches. When you collide with them, there is a healthy self-recalibration that takes place: you learn that you don’t have the market cornered on ministry, that you have a lot to learn, and that you can celebrate the gifts of others without competing with them. Seminaries aren’t just about conveying information. They’re not even mainly about that. Instructors are fully aware that students will retain few of the details covered in class and readings. But that isn’t the point. The goal is actually to model how to learn for the long haul: how to read carefully and judiciously, assess arguments charitably and wisely, learn from others with whom you disagree, track down resources and judge their worth, and so on. It’s a set of tools, not the data, that makes the seminary experience so invaluable. I fear that this gets lost in the general trend of maligning seminaries for their focus on head knowledge. The death of expertise is the latest victim of the toxic imbalances of social media and the attention-span-less internet generation. This antipathy toward specialized knowledge affects the church as well. For some, efficacy is more valued than expertise. For others, expertise is met with outright (anti-intellectual) suspicion. But the ministry remains at its core a learned (learn-ed) calling. While you’ll gain numerous things on-the-job from your pastor and others in your church, no pastor is an expert on everything. Even professional athletes have specialist coaches. There is tremendous value in setting aside time to be trained by numerous people who are actual subject-matter experts, particularly if our calling is to become the most faithful ministers of God’s Word we can be. My goal is not to pendulum-swing back to the other extreme in what can easily become a church vs. seminary competition. The vast majority of seminary educators don’t even remotely think about it that way. We see ourselves as servants of the church, and few things delight us more than seeing our students grow and thrive in the day-to-day of church ministry, both during and after their time with us. Greg Lanier (PhD, Cambridge) serves as assistant professor of New Testament and dean of students at Reformed Theological Seminary in Orlando. He is also an assistant pastor at River Oaks Church (PCA). He lives in Oviedo with his wife, Kate, and their three daughters.